Build Quality (7.5/10): With the exception of the thick metal headband, the UR55 is almost entirely plastic. The cups are large enough for the headphones to be considered circumaural, but only just. The dimensions of the bowl-shaped foam pads mirror those of the pleather pads found on the Fischer Audio FA-004, another small circumaural. The flat-folding cups tend to creak quite a bit at the hinges. On the whole, the structure is mostly solid and while the UR55 may not feel as high-grade as the higher-end DJ100, care was obviously taken with the design. The cable, especially, is impressive – thick, soft, and flexible, it is quite pleasant in day-to-day use despite being dual-sided. Strain relief is ample all around. 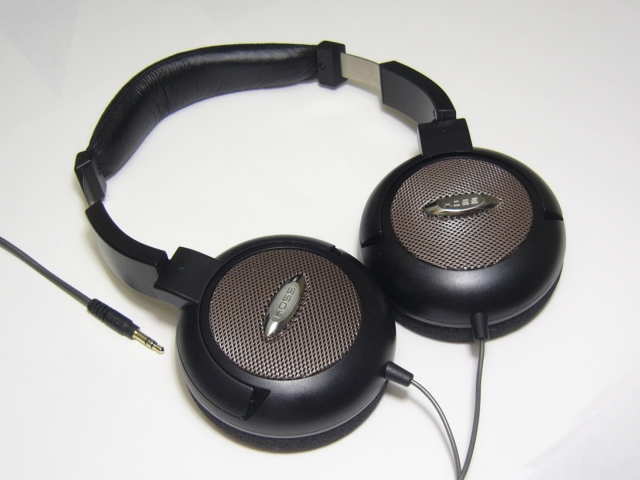 Comfort (7.5/10): The structure of the UR55 has little flex and the clamp of the headphones tends to be a bit strong. The foam pads, in conjunction with the flat-folding mechanism, distribute force quite well but for those with larger heads the headband itself may be a little short. Padding thickness is sufficient on both the headband and earcups. Sound (6.75/10): Koss portables have always been well-liked around head-fi – the Wisconsin-based headphone maker has been winning over the hearts and ears of budget-minded audiophiles for more than a quarter of a century with models like the PortaPro and KSC75. Introduced in 2010 as a Best Buy exclusive model, the new UR55 is a fairly basic headphone in terms of functionality. Marketed as a studio monitor, the UR55 nonetheless offers a consumer-friendly sound that stops just short of the hi-fi inclinations of the higher-end PRO DJ100. At the low end, the UR55 is quick and punchy. Bass depth is decent and a moderate mid-bass emphasis gives the UR55 a sizeable amount of impact. By no means a bass monster, the UR55 still easily beats the bass quantity of the similarly-priced Sennheiser HD428 and goes toe-to-toe with the Maxell DHP-II. The DHP-II provides slower attack/decay times and a softer, fuller note presentation while the UR55 has the upper hand when it comes to immediacy and punch. Bass detail and texture are good as well – the UR55 is not quite as resolving as the higher-end Sennheiser HD25 or Sony MDR-V6 but it competes extremely well with similarly-priced sets. The midrange is the most attention-grabbing aspect of the UR55’s signature. Overall it is aggressive and a bit forward, not unlike the mids of some of the lower-end Koss portables. Vocals come across especially strong – probably more so than with any other portable in my possession. Midrange detail and texture are surprisingly good but the clarity trails the Sennheiser HD428 and Fischer Audio FA-004 a bit. Similarly, the tone of the headphone is quite neutral but not entirely spot-on compared to the Sennheiser and Fischer Audio sets. One issue might be the top end. While clear, detailed, and relatively well-extended, the treble is slightly peaky and can sound a bit ‘tizzy’. It definitely lags behind the FA-004 in overall smoothness. Luckily, listening fatigue is still very low. The presentation of the UR55 is a little more typical – generally well-separated and airy but not as wide as with the HD428. The forward midrange does make the UR55 more intimate-sounding than it otherwise could be but on the whole the presentation is nicely layered and pleasant. That said, those looking for a wider, more spacious soundstage will probably be better off with the higher-end DJ100 or a Sennheiser HD428. Value (8/10): The Koss UR55 is a comfortable, reasonably-well built mid-level headphone. The sound is forward and detailed, offering good overall balance and surprisingly decent instrument separation. Sadly, neither the functionality nor the sound quality of the UR55 really gives it a strong upper hand next to the other <$100 circumaural portables. However, the one thing Koss always seems to get right with their headphones is pricing – even at MSRP the UR55 is a good value. Anything below that may just be worth taking a trip to Best Buy for. I’ve modded a pair of there and they sound fantastic. The soundstage opens up even more and the bass sounds wonderful. I’ve mixed music with them with great results. Of course my warranty is now voided but they were so cheap that I don’t mind paying full price for a new pair if needed. Would be great to get a link to the mods you used just in case someone else comes through reading these comments :). Hi again Joker, sorry for bugging you but I am stuck between these, Koss UR55 and Panasonic RP-HTF600. To recap I was looking for a headphone with very good soundstage and instrument separation (for gaming). Also with very forward mids ,treble and a good sub-bass like the KSC75. But with the most improved detail. The thing I forgot to bring up last time was that you can mod the Koss UR55 and take off the outer mesh. I guess there is a big sound change with this mod. With this mod on the Koss UR55 should I go with them or go with the HTF600. These are the last two cans I have come down too, thanks for all your help! Unfortunately I’ve only tried the stock UR55 so I can’t say how a modded one would compare with the HTF600 (since I don’t know what the magnitude of the changes listed above will be). In stock form I definitely think the HTF600 fits your requirements better and sounds more natural overall, but keep in mind that it’s a bigger and bulkier headphone as well.